The other day, Savage Garden’s Truly, Madly, Deeply song came on the radio. My husband and I half sang along, half mumbled whatever words we could remember from when we were in seventh grade and belted out the lyrics at awkward school dances. This song was my anthem back then, even though the only person I loved truly, madly, and deeply at that age was Bonnie Bell and her fabulous Lipsmackers. This shouldn’t be a shocking realization. But the truth is, a good part of me still feels like an awkward teenager. I worry about the things you aren’t supposed to worry about at this age – am I pretty? Do my friends like me? What am I going to do with my life? I worry that people would judge me if they knew how insecure I am, and so, like any other person of my generation, I hide my secrets on the internet in hopes that someone else will admit to feeling the same. When I was in school, my entire life was before me. I stared at it as if I was before a map, wondering what path I was going to take. I wanted to do so many things – publish a novel, become an aid worker on the other side of the world. Now, I have picked a way and started heading down it. I am a wife and a mother and I love this path, especially the companions I have alongside me. But that doesn’t stop me from wondering if I could have taken another path and ended up in the same place, or if I should drag my travel partners down another road. I must say, the way I’m taking sure does involve a lot of Sesame Street. I scroll through Facebook as I rock my little ones to sleep and watch friends from college walk across Ivy League stages to receive diplomas and extra letters after their last names. I spy on their trips to Europe and burgeoning careers in Africa. I would be lying to say that I wasn’t jealous, or that it didn’t make me wonder if I have done anything substantial with my life. The answer, of course, is obvious. I have birthed and raise two sparkling human beings who, without a doubt, are and will always be, my greatest accomplishment. But for reasons I can’t put my finger on, that’s not exactly what I’m talking about. No path is set in stone, and so as I near 30, I still find myself wondering what I will be whenever I get around to growing up. I debate how much I have to publish before I can start introducing myself as a freelance writer instead of a stay at home mom. And that is not because I don’t believe parenting is an important role in our society. It’s because I have seen that the stay at home moms in my life don’t get credit for all that they do – the raising children, running households, managing finances, volunteering, helping neighbors, working on the side. And, again, I would be lying to say if respect didn’t matter to me. Perhaps I am too insecure. Perhaps I don’t want to let down that little seventh grader who thought she would become the first woman president of the United States. Maybe I need to start trading my uncertainties for contentment. I think that I am where I am supposed to be right now. I’m not sure about that, but for now, it’s my best guess. At some point, there will be another proverbial fork in the road. Maybe I will take it, maybe I will happily keep heading down this same path. And maybe I just need to stop looking back. My son wants to know the name of the bird that is flying from tree to tree on the trail in front of us. I can’t identify the bird, not from this distance anyway, but I know why he is asking. Countless times on our adventures he has heard me murmur, “I wonder what bird that is,” and helped me scroll through pictures until we find a close approximation. “I think it’s some kind of warbler. Maybe a Wilson’s warbler, or a yellow warbler.” He surmises that the bird, being definitely yellow and not resembling anyone named Wilson, is probably of that variety. We have found our answer, correct or not. I like to know the names of my fellow forest inhabitants. Although a name tells me little about the bird itself, being able to identify it seems to offer a degree of understanding. Once I am successfully able to match a living bird with its Audubon picture and name, I begin to see them everywhere. A Steller’s jay hops along a neighbor’s roof. A Western Tanager flits in our bushes, and a Northern Flicker visits our birdfeeder. Red-winged blackbirds sing as we take our walks along the lake, and an Osprey soars overhead. The woods have not come alive, as they have always been so, but now I am able to see it. When our children are born, we give them a name. Five or ten letters to cloak them and follow them for life, to stand in as shorthand for all that they are. We utter their names when they are hours hold, when their hair is still wet and their unfamiliarity with the world is as great as our unfamiliarity with them. “You think the name fits, don’t you?” I ask my husband. He, of course, affirms the choice we had made months prior, before we had even known whom I was carrying inside of me. I stare down. His skin is a reddish yellow, his eyes framed by barely visible wisps of eyebrows, and his nose curves sweetly just as all newborn’s noses do. I do not know what someone of that name is supposed to look like. It will have to do. There is great responsibility in choosing a name for a child, and also none at all. They will define the moniker, not the other way around. We will yell their names when it is time to leave the park, whisper them softly as we say good night, and shake our heads and say their names, laughing, as we look at our partners when the child misbehaves in a way that is oh so typical of himself. My sons are wild birds, creatures I cannot begin to understand with spirits I cannot hope to harness. I have known them since they first existed, but as I try to comprehend their personalities, they slip away, changing and evolving again. Sweet babies turn into rowdy toddlers, and then into little kids with minds of their own. Soon they will be busy school children and teenagers who will most likely refuse to go birding with me. But that is tomorrow. Today, they wear the names we have given them, designations chosen as remembrances of those who came before and prayers for what will follow after. I don’t know why we try to name wild birds. They will most likely fly away before we have begun to understand them. Together, my sons and I peer into the wild, hoping to find homes for the names that fill our tattered bird guides. A name will not divulge any secrets to us, it will not clue us in on the full story of what flies between the trees. A name is only a beginning. It’s another hot night, and I lay on the couch praying that my children will soon fall asleep. The windows are open and in blows a breeze, a welcome respite from the air that has baked inside of our house all day. The wind carries in the neighborhood noise. Babies’ tired cries float out from their nurseries, cars stall, hammers pound. I can smell hamburgers on the grill, and hear the radio play as someone fiddles around in their garage. We flow in and out of each other’s houses, leaving the briefest impressions and slipping away silently. This is summer, and in summer, you are never alone. I open the box and follow the directions. Three minutes later, I see the lines. Two lines. And on the next test, and the one I take later that afternoon, and the one that I do a week later just for the hell of it. Two lines. One for each healthy baby I have carried. One for each week I would remain pregnant. The night before it all happens, we sit on our deck eating pasta with peas. We had planted the small round seeds in the dirt months earlier and waited patiently to see if they would become anything. The early heat of summer had begun to wear on the delicate plants and they started to wilt, and so we had picked enough for one meal before they turned completely brown. We eat our pasta primavera that night, chasing the small green peas around the plates with our forks, my husband and I stealing glances with secret smiles while the boys wave at our neighbors moving in next door. The ER is cold. I walk in, fighting back tears as I wonder if there is any reason for me to be there at all. I know what is happening, what is going to happen. I picture the bill going up higher every time I hear a tech open a new packet of sanitized medical supplies, and hear my husband’s voice telling me not to worry about the cost. His voice is in my head, that is, as he is home with the children, texting me for updates. I think of how warm it was the day we were at the playground, waiting for my husband to meet me on his lunch break. “I know you’re busy,” I had texted him. “But can’t you just sneak away for twenty minutes? We’re at the playground across the street from you.” Finally he acquiesced, agreeing to meet us. I stood there in the heat, waiting, pushing sunglasses back on to my children’s sweaty faces and looking for his car to pull into the parking lot. “I have a present for you,” I said, grinning, as soon as he walked up. “I think I know what it is,” he replied with a smile. “I’ll be right back,” I tell my husband, “just have to run to the bathroom.” The boys keep playing in the creek, splashing, not registering that I had left. There it is. Red. An ending before a beginning. A misuse of punctuation. I hurry back to the spot where we had been playing and whisper to my husband. We keep our faces straight as we tell the children playtime is over, it is time to pack up and go home. My oldest starts wailing instantly. “But you said we could stay here and play! You said we could play!” he cries as we walk back to the car. “I know, honey, I’m so sorry,” I say over and over again. Promises easily made are easily broken. Two weeks is not long enough to think of a name, to know if it is a boy or a girl, but it is long enough. It is long enough to have nicknames, and plenty of time to picture a baby born in late winter, snuggling with us as the snow melted and giggling on blankets in the early summer sun. It is long enough to love. The shortness of the pregnancy is its blessing and curse. I did not have to lose a baby whose heart I had gotten to hear beat, whose feet I had been able to feel kick. The only thing I ever knew about it was that it was there. I am sick in bed, morning sickness overwhelming me. My husband is in the bathroom washing the children up before bedtime, and my oldest peppers him with questions. “What is the hardest thing in the whole wild world?” he asks. “To love someone,” I think to myself. I know that it is still summer, and outside my bedroom I can hear the world. The crows and magpies fight in their mock street gang style and my neighbors fire up the grill and drink beers on their porch. The sound of my children’s laughter floats out of the house. They walk quietly around me, offering hugs and telling me they hope my tummy feels better soon, smiling back at their dad, proud of their own good behavior. In a few months, when this summer fades, we will shut our windows and retreat into our cabins once again. But now we are here together, almost touching. I close my eyes and listen to the hot wind bringing in the noises of the world. It is not the connection I want, only the one I have. I was pregnant, and now I’m not. Today I’m excited to share I have an article on BonBon Break about the importance of taking your kids on microadventures! I hope you check it out! When having kids made our family budget and free time shrink to never before seen lows, my husband and I realized it was time to pack up dreams of vacations of travelling and start embracing the microadventure. By definition, the microadventure is a short trip into nature – going on a day hike rather than walking the Camino de Santiago, for example. Calling these activities “microadventures” is mainly just a turn of phrase, but thinking of our simple outings as mini expeditions has given me a new perspective. Even in our hometown, we can find plenty of opportunities for learning, excitement, and fun. “A black man fell victim to vigilantes as he drove home from his minimum wage job after dark one night. They stripped and beat him and left him for dead. A businessman happened to be driving behind him down that road. When he saw him, he pulled out his phone and tweeted, “#AllLivesMatter,” and continued on his way. 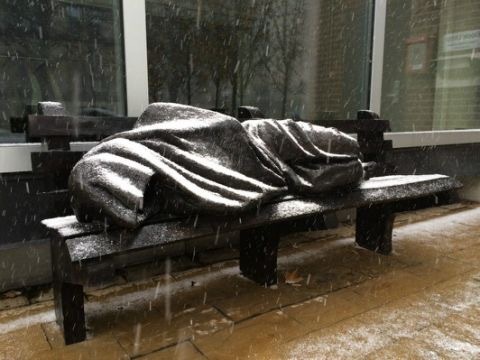 But a homeless man, perhaps knowing what it felt like to be left behind, abused, unwanted, hated and unloved, came upon him and was moved with compassion. He approached the victim, held his head and sang him songs. And then he did the most important act of all – he believed the young man when he said that he was in pain. He listened when he said he was hurting. Today I am excited to have an article about a topic that’s near and dear to my heart up on Parent.co. The way we view caregivers like stay at home moms has big consequences for all parents, especially working parents. It’s about time for policy to stop treating it that way. Read more about the 6 Ways American Policies Undermine Equality and Fail Parents. It is my firmly held belief that children should be dirty in the summer. Lips should boast the stains of berries stolen from bushes, and the juices of watermelons must drip down chins onto bare bellies. Sandal clad feet should sport tan lines made of sun and dirt, and sweaty hair should cling to the back of necks. Knees must always colored as green as the grass they tumble upon. Garden dirt should take up residence under fingernails. Summer, if done properly, will involve fingers sticky with melting ice cream on at least one occasion. We went to the playground one summer day, nothing more planned than a few trips down the slide and a turn on the swings. Children, being the original masters at deceit and deception, found the solitary puddle on the otherwise arid landscape. They ran, they splashed. They felt the mud seep between their toes, mix with their hair, and fill them with joy. By a picnic table, I stripped my son down to his diaper and gave him a makeshift bath with the sun warmed water from my bottle. He walked back to the car naked but his diaper, sunhat and shoes, returning stranger’s confused glances with his beaming smile. Children should be dirty in the summer. How else will they meet a frog who lives in a muddy pond, know the taste berries that have only just left their branches, or see the view from the top of a sap covered tree? With the possible exception of watching the newest animation in a movie theater on a hot afternoon, a child’s memory of summer is formed outdoors. There are metaphors I could make here. That childhood is a time to get dirty, to make and learn from mistakes. I could say that children are born innocently wild and should be left as such for as long as possible, or wonder how they will learn about a world they have not experienced firsthand. But I will leave such ruminations for drearier months. Summer’s children should live outdoors, and we with them, dirtying our feet and rinsing off with garden hoses, alongside these experts in adventure. And at the end of the day, when we slip sweet smelling babes into their beds, clean and cool, we will know that we have lived, and lived well. Dirt does not last for ever, nor does summer.